In the music world, there are as many opinions on record labels, their importance, and their benefits as there are artists. Some people see them as money-sucking heartless money-takers, but that opinion can be a little biased. Just a bit. Regardless of your opinion on labels, the truth is that changes in the music industry have not left record labels unaffected. Factors like media distribution and artist recruitment and payment have resulted in major labels merging or closing. The same factors have also made room for the emergence of a multitude of independent, or indie, labels. A hip-hop based indie label, Rhymesayers Entertainment began in Minneapolis, Minnesota in 1995. It was founded by four members with background and experience in the music industry, including the two members of Atmosphere (which is, of course, one of the acts signed to the label). Other artists on this label include Brother Ali and Aesop Rock. Since 2008, the label has put on a huge annual music festival in Minnesota. Established in 2007, Glassnote focuses on Indie, Folk, Alt-Rock, and Hip Hop artists. They released the debut album for Phoenix, as well as albums for Mumford & Sons, Childish Gambino, and Two Door Cinema Club. The company has offices in New York, Los Angeles, Toronto, and London. Rough Trade Records was founded all the way back in 1978 by Geoff Travis. You may be surprised by some of the artists this indie label has worked with: The Smiths, The Strokes, Belle and Sebastian, Alabama Shakes, Arcade Fire, Edward Sharpe and the Magnetic Zeros, and My Morning Jacket, to name a few. Rough Trade Records is based in London. In 1999, Syd Butler (bassist of Les Savy Fav) began Frenchkiss to release his band’s second record. Besides working with his own band, the label has discovered several other great New York bands. These include indie giants Local Natives, The Hold Steady, The Antlers, and Passion Pit. The label keeps a small roster to ensure quality records. It has also expanded to offer distribution (for other indie labels) and publishing options. Neon Gold has a solid understanding of what good music is as well as foresight into which acts will take off. The indie label, based in both New York and London, signs acts that get major attention. This includes Gotye, Ellie Goulding, and Marina and the Diamonds; they also released Passion Pit’s “Sleepyhead” single. Oh, and one of the label heads fronts MS MR. Definitely keep an eye on these guys! The music industry is still changing, and the future of record labels is unclear. For now, it looks as though indie labels will continue to gain power and influence, opening the industry up even more. This might mean that independent bands have a better chance now than ever before. Have you worked with these labels before? How did it go? 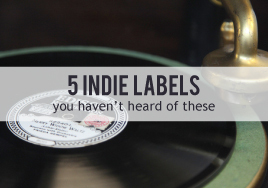 What other indie labels should musicians know more about?